Yes I love to celebrate Birthdays! Next Friday we’ll give one lucky person one of our sweet smelling Sachets! Just let us know which of these sayings is best fitting for yourself or a friend & why : )! 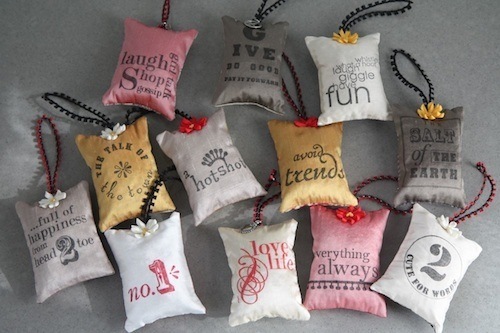 If you’re the lucky one, you will get to chose one of these fun sachets in-stock! What great gifts these would make. I think the one that is more me is “no 1” and if I were to choose one for a friend would be “the salt of the earth”. I also like the Flock collection…”L’, “J”, or “F”. So hard to decide as they all are wonderful….hmmm…my friend is a hot shot! I love them all, but I am going to go with “GIVE DO GOOD PAY IT FORWARD ” because I have an Etsy shop and I love listing pay it forward items where the customer only pays for the listing fee (.20) and shipping. Hi Mighty Madge! Please contact me with your information and select any of our Sachets in store! Congrats!